Designs by Lisa Somerville: They Say It's Your Birthday! Today, myself and some of my fellow Design Team members at Our Daily Bread Designs have gotten together for a Birthday Blog Hop to celebrate Kelley's Birthday! Kelley's birthday is actually tomorrow, October 7th, but we thought we might actually "surprise" her by posting a day early! Happy Birthday Kelley! Wishing you the treasure of happy yesterdays and the gift of bright tomorrows! Everyone always needs ideas for Birthday cards, and I'm sure you'll find a ton of inspirational ideas along the way, so grab your favorite cuppa and join us as we celebrate Kelley's Birthday! If you've arrived here from Chris' Blog, you are in the right spot, if not you can head back to the ODBD Blog and start from the beginning so that you don't miss any of the fabulous cards! 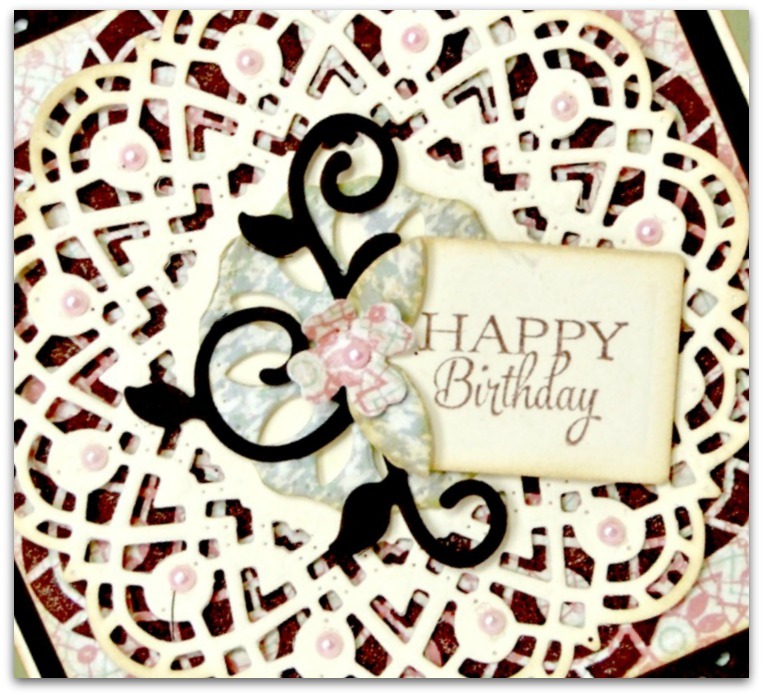 To create my card, I used papers from the ODBD Soulful Stitches Paper Collection, along with the Birthday Doily stamp set. I stamped the doily in Espresso in on the pattern paper, then embellished using the ODBD Custom Doily Dies. The sentiment is stamped in Espresso ink on Vanilla card stock then die cut using the smallest tag from the ODBD Custom Recipe Card and Tags Dies, embellished with die cuts cut from the pattern paper using the flower from the ODBD Custom Ornamental Crosses die set and leaves from the ODBD Custom Fancy Foliage die set. To further embellish I added pink pearls from Zva Creative. The next stop on the Birthday Blog Hop is Sandee's Blog! Oooh, love the layered doilies and the little flower is perfect! Gorgeous card....she will love it!! HUGS!! the doily looks great between the two borders, very pretty! Oh, Lisa, I love the doily with flower and the borders add a beautiful touch! Kelley will love it!! Hugs, sweet friend! Gorgeous use of the doily! Love the gingham and borders! Love the doily layers and colors!! Beautiful birthday card for Kelley! 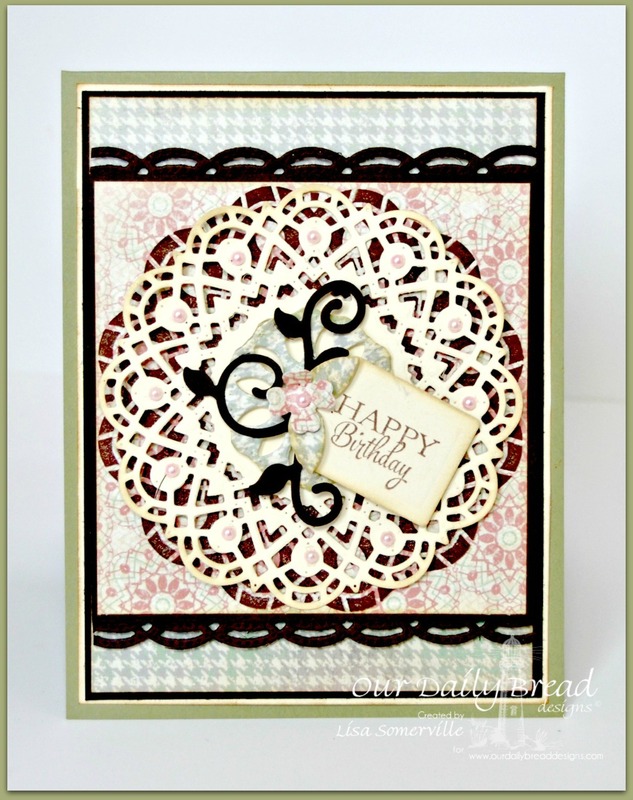 Gorgeous, Lisa…love the layered doily on the stamped one! Beautiful colors that I know Kelley will love! Lisa, it's so lacey and pretty! I'm sure Kelley will love it!!! Love the layered doilies, a beauty, Lis! This is so pretty Lisa! Kelley will love it with the layered doilies and gorgeous dp! Beautiful card Lisa. I love the black that you've used (makes the rest really pop out!) and the layout is gorgeous.